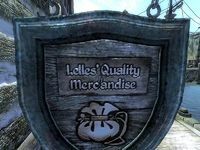 Lelles' Quality Merchandise is a general store located on Anvil's Waterfront. It is found next to The Flowing Bowl and the Harborside Warehouse. The proprietor, Norbert Lelles, has 800 gold and a Mercantile skill of 40. He will buy anything from you, while only selling various miscellaneous items, including a pair of Boots of the Eel (a guaranteed magic item). He also sells the unique Apron of the Master Artisan which fortifies your Security, Alchemy, and Armorer skills. The main trading room is on the ground floor and consists of a counter and a selection of Norbert's wares on display. He lives upstairs, as is usual with Anvil houses and stores. His private quarters consist of a small dining room and two bedrooms, one of which contains the Boots of the Eel. There is an unlocked door on the ground floor which is accessible from behind the store. The sign outside the front door: the sign maker originally left out the "h" on the store's sign, but one was marked in afterwards. The key to the store is "Lelles' Quality Mercandise Key"
A line of dialogue says: "He runs Lelles' Quality 'Mercandise.' Ha! Not a bad sort. You can usually find him in his store." The notes for this dialogue state "'mercandise' intentionally misspelled". During the Fighters Guild quest The Unfortunate Shopkeeper, you have to confront a group of thieves who continually break in his shop and steal his goods. He leaves you alone in the shop for a good time, during which you can steal everything without a chance of being caught or followed. You can later fence these items. 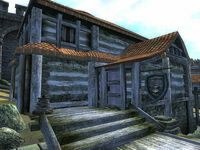 A handbill advertising the store reads: "Lelle's Quality Merchandise has the best prices and the largest inventory in Anvil. Don't bother with those other shops. We'll beat their prices everytime." A cell for a basement to the store exists but is unused. This page was last modified on 26 December 2018, at 12:55.